Pressure sores are a very serious– yet preventable problem that plagues many nursing home and hospital patients. Now, new technology in the form of a Pressure Mapping System can help identify areas on a patient’s body that may form pressure sores. The new technology would assist doctors in preventing bedsores before they start to form. Pressure sores (also known as decubitus ulcers, bedsores, and pressure ulcers) are areas of skin and tissue that have been damaged by inadequate blood flow because of sustained pressure. Nursing home residents and hospital patients are at increased risk for pressure ulcers because of decreased mobility, wheelchairs, and bed confinement. Pressure mapping is a useful tool for doctors to help assess patients who are susceptible to developing pressure sores and making an early diagnosis in patients with existing pressure sores. A pressure map helps reveal what is happening underneath a patient’s skin. It allows doctors to see areas of pressure under a patient’s skin that are not yet apparent on the skin’s surface. The mapping device is actually a thin mat that has sensors attached to it. The mat is placed between the patient and the bed, wheelchair, or other seating surfaces. These sensors, which are attached to a computer, read the amount of pressure exerted on them, creating a color-coded map of the pressure distribution. 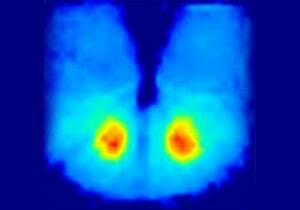 This image can help a caregiver determine high-pressure areas. Then, the caregiver can implement preventative measures so pressure sores do not occur. Pressure-reducing measures include changing positions more often, changing body position, changes in equipment, using special cushions, pads, mattresses, and beds that relieve pressure, and using foam, air, or water-filled devices to cushion a wheelchair seat and foot rests. Pressure mapping systems are not without their problems. There are some concerns with the lack of standardization in how different devices report pressure readings. In addition, some devices simply report an average pressure reading over a larger area, which might under-report the pressure in small bony areas surrounded by lower pressure areas. Therefore, pressure maps should be used as just one tool in effectively diagnosing and preventing pressure sores. It is important that doctors and caregivers still perform detailed skin inspections for signs of pressure sores. Pressure mapping systems can help prevent dangerous and painful pressure sores, which improves quality of life and reduces the cost of treating pressure ulcers. However, some facilities might not be able to afford the high cost of such a system. Ridge Meadows Home Care Team was able to purchase a $17,000 Pressure Mapping System because of a $10,000 donation. When choosing a nursing home facility, it is important to ask about preventative measures such as a pressure mapping system, especially if you are at increased risk for pressure sores. Lippincott’s Nursing Center: Wound and Skin Care – Can pressure mapping prevent ulcers?